The US Army Land Warrior is an integrated fighting system for individual infantry soldiers that gives the soldier enhanced tactical awareness, lethality and survivability. The US Army completed developmental testing of the Land Warrior 1.0 system in February 2003. 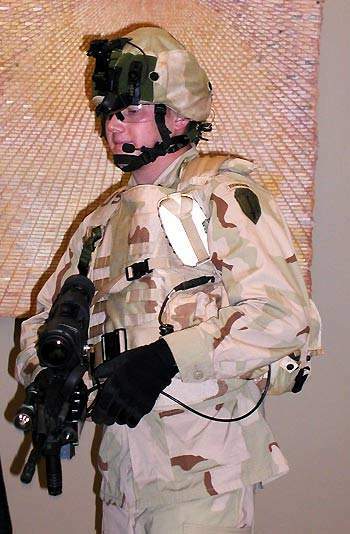 Land Warrior systems include the weapon, helmet, computer, digital and voice communications, positional and navigation system, protective clothing and individual equipment. The Land Warrior infantry soldier is armed with an M4 Carbine, .223 caliber, fitted with a Daylight Video Scope (DVS) and Thermal Weapon Sight (TWS). When the Land Warrior soldiers are in the Stryker vehicle, a Vehicle Integration Kit allows voice, data and power communication via an umbilical connection. The Land Warrior soldiers in the Stryker can communicate through the vehicle's Force XXI Battle Command Brigade and Below (FBCB2) Appliqué, with the Army Battle Command System. The 2kg (4.5lb) Land Warrior helmet provides ballistic protection and carries the main components of the soldier's communications systems. Programmable control buttons on the weapon allow the soldier to carry out procedures without lowering the weapon. A quick disconnect weapon cable connects the weapon electronics to the hub. The Land Warrior is an integrated fighting system for USA infantry soldiers. The US Land Warrior is an integrated fighting system for individual infantry soldiers which gives the soldier enhanced tactical awareness, lethality and survivability. The systems integrated into Land Warrior are the weapon system, helmet, computer, digital and voice communications, positional and navigation system, protective clothing and individual equipment. The Land Warrior system will be deployed by infantry, and combat support soldiers, including rangers, airborne, air assault, light and mechanised infantry soldiers. The US Army launched the Land Warrior programme in 1994. An engineering and manufacturing development contract was awarded to Raytheon Systems, then Hughes Aircraft Company. Plans were drafted to build an initial capability (formerly Land Warrior Block 1) and then a Land Warrior Stryker Interoperable (formerly Land Warrior Block 2). In February 2003, a contract was awarded to General Dynamics Decision Systems (now General Dynamics C4 Systems) to enhance the Land Warrior system with integration to the US Army digital communications, interoperability with the Stryker Brigade Combat Vehicle and a system weight reduction. "Land Warrior is an integrated fighting system for individual infantry soldiers." The industrial team led by General Dynamics C4 Systems includes General Dynamics Land Systems, Computer Sciences Corporation, Kaiser Electro-Optics Inc, Omega Training Group, PEMSTAR, PEMSTAR Pacific Consultants and Thales Communications. The first Land Warrior Stryker Interoperable systems (Mounted Warrior) were delivered in 2005 for testing and assessment. In February 2005, the US Army decided to merge the Land Warrior Advanced Technology Demonstration (ATD) programme with the Future Force Warrior (FFW) ATD, to enable more efficient spiral development of new technologies. The merged programme is managed by the US Army Natick Soldier Center with General Dynamics C4 Systems as prime integrator. The FFW ATD is to develop the Ground Soldier System (GSS), the next generation of Land Warrior. It will transit mature technologies for insertion into Land Warrior programme before the end of the ATD. The US Army began operational assessment of the Land Warrior and Mounted Warrior systems in May 2006 with the 4th Stryker Brigade Combat Team (SBCT) at Fort Lewis, Washington. 440 Land Warrior systems and 147 Mounted Warrior systems were used in the assessment. The assessment concluded in September 2006 and was followed by limited user test. In February 2007, the US Department of Defense announced the proposed cancellation of the Land Warrior programme. However, in June 2007, the 4th SBCT equipped with Land Warrior and Mounted Warrior systems were deployed to Iraq. In July 2007, the Senate Armed Services Committee published a report recommending that the US Army review its decision to terminate the programme and funding may be restored. Funding issues have not been resolved, however Congress has made some appropriations for the programme. In October 2007, the US Army announced that the Land Warrior system was being upgraded to make it up to 3lb lighter. The system will also include a Boomerang sniper detection system from BBN Technologies. 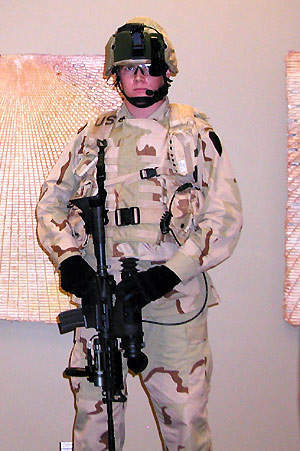 In May 2008, the US Army reported that the weight of the Land Warrior systems deployed in Iraq had been reduced from 17lb to 10lb. 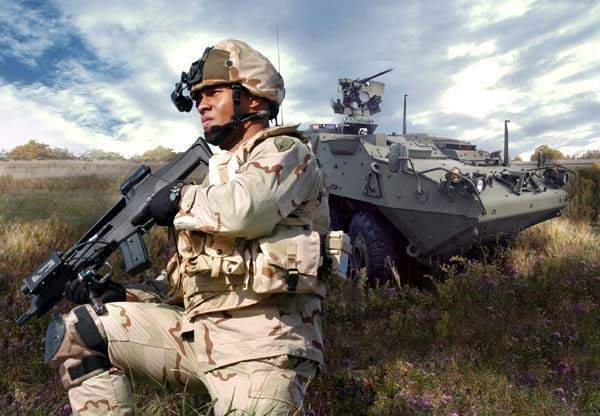 In May 2008, the US Army approved an operational needs to statement to equip an entire brigade combat team, the 5th Stryker Brigade Combat Team, with the Land Warrior system in 2009. From October 2008, a number of Land Warrior systems are being assessed by the army evaluation task Force (AETF). AETF is tasked with the evaluation of technologies for the US Army’s future combat systems (FCS) programme. The US Army received 900 Land Warrior ensembles, 300 vehicle-integration kits, and associated equipment by October 2009. In October 2009, General Dynamics C4 Systems was awarded a $50m multi-year contract to provide engineering and logistics support for the Land Warrior programme. The contract provides $19m for the first year and includes two optional years. The system is modular and tailored for the soldier’s task and mission. The unit commander decides the components of Land Warrior that will be deployed for a mission. The two main Land Warrior configurations are for the soldier and the squad leader. 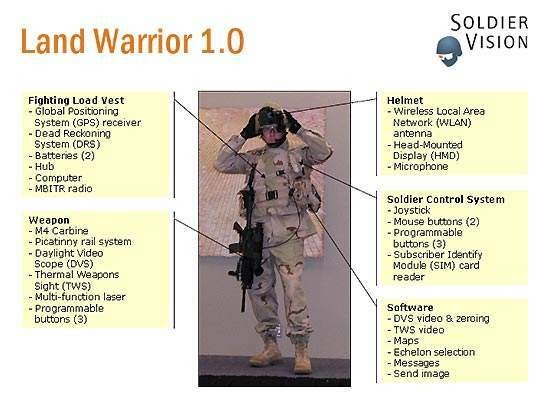 The soldier LW version includes a radio with short range inter-squad voice and data communications. A squad leader’s LW system includes a multi-band inter- and intra-team SINCGARS compatible radio, a keyboard and handheld flat panel display. The soldier wears a fighting load vest for carrying and interfacing with the sensors and the computer. The soldier is able to adjust the load distribution from shoulders to hips while on the move. The electronic systems are connected and integrated via the ten-port hub installed on the body. "The 2kg (4.5lb) Land Warrior helmet provides ballistic protection." 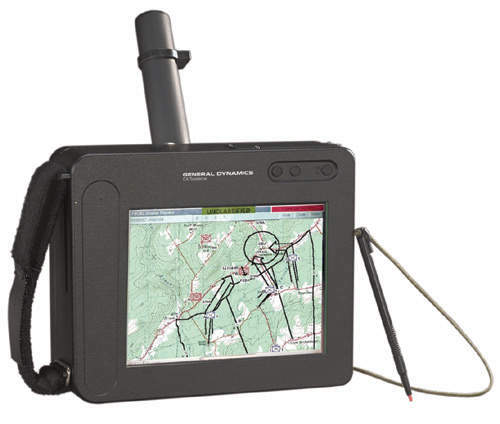 The soldier’s navigation system comprises a Global Positioning System (GPS) and a pedometer dead reckoning system that tracks the soldier’s position and is used when the GPS is unavailable, e.g. inside buildings. The GPS uses five satellites and defines the soldier’s position to an accuracy of 10m. The power system, either disposable or rechargeable batteries weighing 1.1kg (2.5lb), is installed on the body. The system provides between eight and 24 operating hours of power for the sensors and computer. The disposable batteries have longevity of four to 12 hours and the rechargeable batteries eight to ten hours. The US Army Communications-Electronics Command awarded Vitronics a contract in 2002 for the integration of power aware technologies into Land Warrior. The Land Warrior computer is also installed on the body. The computer operates on Windows 2000 operating system and uses a 500MHz Intel Strong Arm processor. The battlefield software is installed on the computer. The sensor data is downloaded onto the computer. A Multi-Band Intra and Inter Team Radio (MBITR), integrated into the vest allows voice communications between the infantry soldiers. The Land Warrior Squad Radio, supplied by Thales, is a SINCGARS compatible, eight-channel radio operating over 30MHz to 88MHz and the design is based on a repackaged commercially available radio, the PRC-6745 Leprechaun radio by Thales Communications. The soldier radio for the Land Warrior first spiral is the Raytheon MicroLight. The 2kg (4.5lb) Land Warrior helmet provides ballistic protection and carries the main components of the soldier’s communications systems. "The two main Land Warrior configurations are for the soldier and the squad leader." 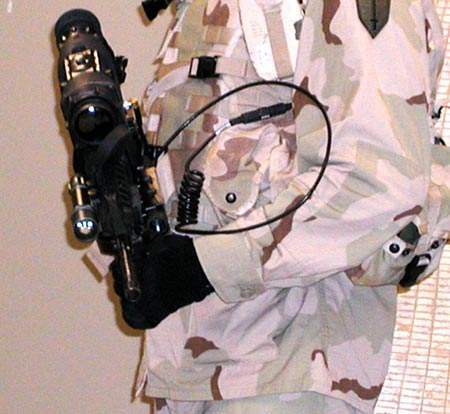 The Wireless Local Area Network (WLAN) antenna is installed in the helmet and connects via the hub to the MBITR radio carried in the soldier’s fighting load vest. The range of the radio is 1km within line-of-sight. The helmet carries a Head-Mounted Display (HMD), which is positioned over the soldier’s dominant eye and provides command and control information and situational awareness. The display shows the video from the daylight video scope or the infrared thermal weapon scope mounted on the soldier’s weapon. It also shows satellite and topographical maps with friendly positions, updated every 30 seconds. The soldier can switch screens using the select button on the stock of the rifle. The helmet-mounted display is used for zeroing the daylight video scope, capturing battlefield images and for sending and receiving data. Rockwell Collins received a contract in January 2009 for 1,500 HMDs for Land Warrior systems. Rockwell Collins ProView S035 monocular has a colour super video graphics array with a 35° diagonal field of view. The Land Warrior control system is carried on the soldier’s body. This enables the soldier to interact with the menus in the helmet-mounted display. The control unit has a joystick for moving the cursor, and mouse buttons for menu selection on the helmet-mounted display. Three programmable buttons can be set to push-to-talk and for zeroing weapons. A SIM (subscriber identity module) card reader identifies the soldier and controls access. The Land Warrior infantry soldier is armed with an M4 Carbine, .223 caliber, with a 30-round magazine. The M4 Carbine operates in semi-automatic or three shot burst. The rifle is fitted with a Picatinny rail for mounting sights and a grenade launcher. "The Land Warrior soldier is armed with an M4 Carbine, .223 calibre, with a 30-round magazine." The daylight video scope (DVS) has a zoom with magnification 1.5x to 6x. The Land Warrior thermal weapon sight (TWS) from DRS Electro-Optical Systems Group, operating in the eight to 12 micron band, can be fitted on top of the M4. 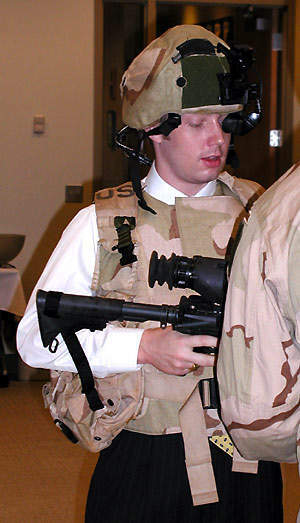 In June 2005, DRS was awarded a contract by the US Army to produce a family of next-generation TWS, based on uncooled thermal imaging technology, for the M4 and other weapons. In November 2006, the US Army placed an order with DRS for 1,600 light, 3,900 medium and 2,000 heavy TWS II sights. A multifunction laser measures the azimuth and range to the target and designates the target with a red dot. Programmable control buttons on the weapon for push to talk, switch screens and take a picture commands, allow the soldier to carry out procedures without lowering the weapon. A quick disconnect weapon cable connects the weapon electronics to the hub. The laser rangefinder and digital compass gives the soldier the range and direction of the hostile target. The data, coupled with the soldier’s own location (defined by his global positioning system), provide the soldier with accurate target location when he calls for indirect or support fire and for combat identification. In October 2007, a contract was awarded to General Dynamics for the integration of the BBN Technologies Boomerang sniper-detection system. The Boomerang system consists of a number of small microphones which detect muzzle blast and a display giving precise distance and direction of the sniper. The Land Warrior software suite contains six main software packages for weapon sights and for data. The mapping software package controls the display of satellite generated and topographical maps. The satellite image technology allows maps to be generated and viewed by the infantry soldier within ten minutes, compared to the six to eight-hour time delay currently experienced by front line soldiers. Friendly positions on maps are updated every 30 seconds. The echelon selection control software allows the soldier to control the amount of data received, for example the positions of team members, squad or company. The software ensures that the soldier is not overloaded with data but receives the information needed for his mission and situation. The send image programme allows the soldier to capture and send battlefield images. "The Land Warrior control system is carried on the soldier’s body." In June 2005, General Dynamics C4 Systems was awarded a contract to provide up to 500 Land Warrior Stryker integration kits. Delivery of the assessment versions began in 2005. When the Land Warrior soldiers are in the Stryker vehicle, the Vehicle Integration Kit allows voice, data and power communication via an umbilical connection. The Land Warrior soldiers in the Stryker vehicle can then communicate by voice and data to soldiers inside and outside the vehicle, to soldiers in other Stryker vehicles and, through the Stryker vehicle’s Force XXI battle command brigade and below (FBCB2) Appliqué, to the Army battle command system.